If you want to change the parameters like aspect ratio of MPEG4 (mp4) then you have to open it an video editor and do the changes and then re-encode the entire video. The video encoding is a CPU intensive task and takes lot of time to complete so if these parameters can be changed without re-encoding then we can save lot of time. MPEG4 Modifier is free tool that allows you change the parameters like aspect ratio (16:9 to 4:3 & vice versa, pixel aspect ratio and display aspect ratio), video codec in use and interlacing settings without the need for encoding the entire video file again. 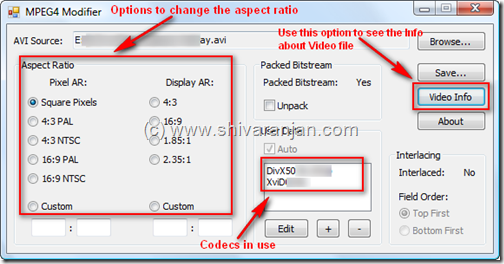 It also shows detailed technical information like aspect ratio, type of pixels, FourCC used and etc of the video file. To change the parameters of a mp4 video file load the file into the tool and then do the changes and then save the file as it does not re-encode the video file the output file will be ready quickly. This tool does not require any installation hence can be used as portable application in USB flash drives. MPEG4 Modifier runs on all versions of Windows and requires .NET Framework 2 and above. In spite of the name of the program “MPEG4 Modifier” and the comment that it can modify mp4 files, this program actually can’t edit mp4 files so the name of the app is incorrect. It can only edit AVI files with DIVX video streams and mp3 audio streams (mp4 files are a different “container” format with h264 video and aac audio). So if you want to fix the aspect ratio of an mp4 file, you have to convert it to .avi, fix it with “MPEG4 Modifier”, then convert it back to .mp4. This works, but takes a lot of time and requires a lot of unnecessary conversions. Does anyone know of a utility like “MPEG4 Modifier” that actually fixes mp4 files directly? “MP4 Modifier”? All I need to do is correct the DAR (Display Aspect Ratio) value in the mp4 header. There’s an application called mkv converter which converts the container format from mp4 to either mkv or avi and mkv to either mp4 or avi, within “2-3 minutes” without losing on quality and size. It’s like magic. I have both these applications (mkv converter and mpeg4 modifier) but I haven’t tried doing it what you mentioned above. But you may. Just google search Step by Step Guide on How to Change Video Aspect Ratio with iDealshare VideoGo, you will find a detailed tutorial.